I’ve now spent Friday and Monday mornings attending assemblies, of a sort, for my kids’ schools, in celebration of the holidays. On Friday, it was at the big kids’ school, where Maya did an Israeli dance. At least, that is how it was billed. It mostly just looked like a kid of hip-hop sort of thing, but it was cool and I loved seeing her up there. She was – and still sometimes is – a very shy child, so the fact that she joined dance and then went up on stage pleases me no end. But the rest was just a disorganized mess of different groups coming up to sing and I was bored silly. At one point, I even got out my journal (which I carry everywhere) and began to write, but that was when the neighbour’s kid came up and demanded to sit on my lap. She’s cute, so that was a good amusement too. She’s 18 months old and calls me ‘Mommy’. Monday was some Hanukkah party thing at Boo’s school. The parents were all ordered into a big room with chairs all around the perimeter, so we all sat. But then the kids arrived and just started milling around. Turns out the teachers were manning these lame little game stations and we, the parents, were expected to hang out and play the stupid games with them. The first-time parents lept right into this and dutifully followed their kids around. The old-timers among the crowd stared at each other in horror. If we wanted to play with our kids, we wouldn’t have stuck them in school now, would we? Guilt demands we show up and watch them perform, but play with them? Please. We stood around chatting with each other while our kids hung off us, and counted the minutes until we were freed. Thank god that is over. Today, my spam-checker popped from 15 up to 27, but only deigned to show me three of those comments. They were all spam, so at least it managed that successfully, but whether the other 10 were too, I’ll never know. I love getting comments, so every time this happens, I fear a lost comment somewhere. I wish I could figure that spam thingie out. I had no idea spam was such a big problem for bloggers too, but it turns out it is HUGE, and I would hate to have to delete comment after comment as spam, so I suppose I should appreciate the spam-catcher. But I always wonder. Because the FM alone is never enough for my body to throw at me, the pain du jour is a screwed-up teeth. My teeth are weird and never do what they are supposed to. Even freezing them is a crap-shoot for the dentist. So this was a simple filling, the last in a long line I needed to have done (still need 2 more crowns, though). I have very soft, close-together teeth and that, combined with a dentist who was going blind and refused to admit it to anyone, meant years and years of reconstructive dental work for me (and two lost teeth). But I had the tooth filled a week and a half ago and the pain just gets worse. I’ve been living on advil. This always happens right before holidays. I see more root canal in my future. It is the last molar on the left top and doesn’t have a matching bottom (thanks to the last dentist), so I’d just have them pull the damn thing if I weren’t so severely afraid of the pain. The last tooth I had pulled was done when my son was a month and half old. I had him without any pain meds at all and I am not exaggerating one bit when I say that the bloody tooth hurt far worse than the labour ever did. As I mentioned earlier, Asher’s big gift this year was a purple lightsabre, to go along with his red/blue one, green one and double-sided one. He likes lightsabres. He likes Star Wars. My six-year-old son felt a little sick a few days ago. Just a wee bit. He said he felt ‘yucky everywhere’ and ‘too tall’. I don’t know what that means, but I figured it wouldn’t kill me to keep him home. Actually, I dragged him around on errands with me. We needed groceries. When I go grocery shopping, I try to detour the toy section, but scattered out into the front aisle was one last lonely cheap light saber. You press a button and the plastic thingie pops out, then press it again to get it all back in again. My boy was beside himself with joy. 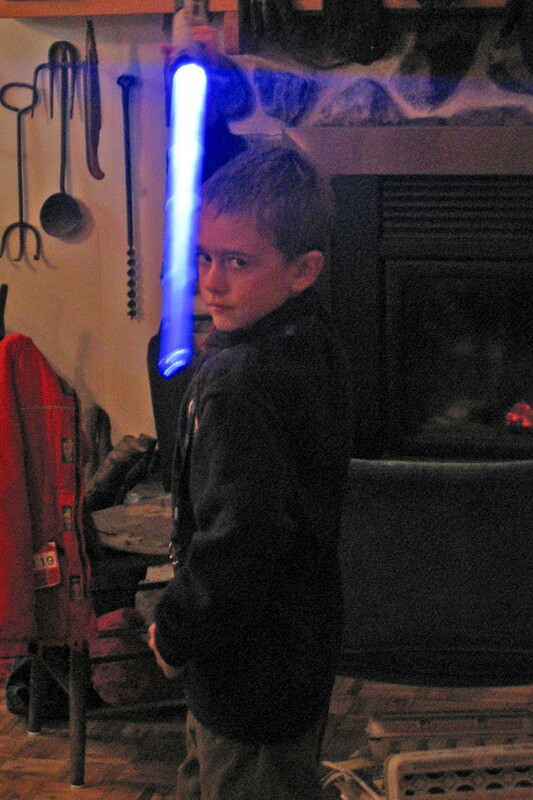 We just recently introduced our kids to the original Star Wars movies, inspired, of course, by the new one coming out. It is a bit ironic, because there is no way I am letting them see the new one, but we had the original trilogy on video and we figured our son and nine-year-old daughter would enjoy them. My daughter found them mildly interesting. My son plunged into them whole-heartedly. He has already seen them so many times I have lost track. He has enough money saved to buy a fancier one, so I told him that he could hold off a day or two and we would go to the toy store and get one that makes sounds or lights up. He said, “No! I don’t want to wait one second longer! I want this one. Look, I can make the sounds.” Then he flipped the thing open and started making very good swooshy noises with his mouth. Right, the cheap one it is then.When we got home, he insisted on watching Return of the Jedi again, because he has a green light saber, and Luke’s is green in that movie. Then he mimicked Luke’s moves. Then he followed me around all day saying things like, “Jacob says that when Obi-wan says, ‘Kill me now and you will only make me stronger’ to Darth Vader, it isn’t really true, but I think it is, because then he can go anywhere, right?” and “Sometimes Eric draws yellow light sabers, but that’s stupid because no one has yellow light sabers.” I thought to myself: a geek is born. And he hasn’t even seen episodes one and two. Those are words I have very rarely heard. Well, never heard. I am a geek. The fact that I own the videos of the first trilogy should be proof enough of that. But I admit I’ve grown out of most of that sort of geekiness. I have yet to see the latest movie. But all that useless information is still stored in there, instantly accessible, to allow me to have conversations with my boy about what is a better weapon in a fight, a blaster or a light saber, and whether light sabers have on/off buttons. My husband was a little cruel, watching our son prattle endlessly one about some detail or another, then turning to me and saying, “You must be so proud.” Geek breeds true. But you know what? I am proud. Not because I managed to produce a child destined to be a nerd like me (he practically cried with joy when we gave him a dress shirt and real silk tie like Daddy wears for his sixth birthday, so we’ve known for a while what we are in for), but because I have something I can really talk to my boy about. He is not what people often call a typical boy, with a room full of action figures and turning every toy into a gun. But he does like hockey, Bionicles and Spiderman. And, very sensitive to noise, I think my most frequent comment to him is, “Could you please use a quieter voice?” as he treats the house like a jungle gym and sings loudly at the same time. As he grows older and more boy, I see him choosing to hang with Dad more than Mom, and I understand that. But now I have an in. My husband only has the most vague interest in all things Star Wars. So I am nurturing my son’s little obsession and watching it grow with unmitigated glee. When I was 16 years old, I despaired of ever finding a boy interested in me. Those who shared my interests in science fiction and the like were barely able to even speak to a girl. If only my adolescent self had realized that all that training would pay off one day. That more than 20 years later, I’d use my knowledge of Wookies, droids and alien planets to attract the boy I love most of all: my son. Not something anyone who knows me would expect to hear. But really, enough of this rain! We had a brief respite, with snow and sun and all, and I felt like I could breath again, but it only lasted about a week. Now the snow has pretty much melted and we are back to rain, rain, rain. I think the flax in my garden is actually growing. I like winter. I usually want it to be shorter than it is, but I do like it. I like skating and snowshoeing and tobogganing. I like the sun shining on big piles of snow and Christmas lights reflecting on it. Months worth of puddles are really, really starting to piss me off. I can’t remember when my FM has been this bad. I am a big, useless blob. I think it is making my kids crazy too. They are being horrible and whiney and constantly pick at each other. I’m going to blame it on the weather because the alternative is that I just have horrible children. Even when they aren’t horrible, they are driving me nuts. As I write, Boo is talking. And talking and talking and talking. It is just endless prattle. At one point in the car, I actually lost my mind and said, “Oh Boo, enough already!” I got one marvellous moment of silence, because of course she was completely shocked, and in that moment realized that as much as she is driving me bananas, it is still better to have her talking to me than not, and said, “Enough with this rain! I can’t stand it one moment longer!” And the prattle continued, this time on the subject of rain.